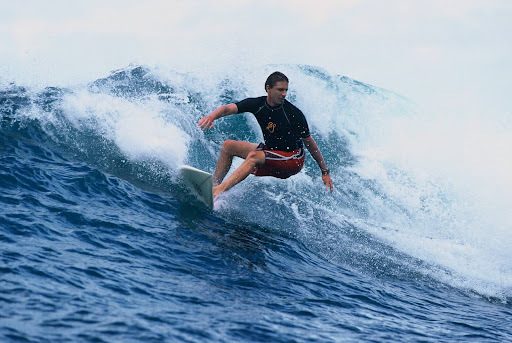 I went to Tavarua, a world famous surf island in Fiji, for the first time last summer. I was fortunate to be with a great group that brings Scott Winer, associate photo editor of Surfing Magazine, along every year to take surfing shots. Scott is a world class photographer, a great bodyboarder and a not so great backgammon player (which I took advantage of). Tavarua has three main breaks: Cloudbreak, a reef that captures energy from deep water swell rolling out of the Southern Ocean to produce massive barreling left breaking waves; Restaurants, another reef break that’s a little smaller than Cloudbreak but churns some of the most amazing left barrels on Earth; and Tavarua Rights, which very rarely breaks (to my dismay as a regular-foot). Here’s some interesting trivia: The character played by Tom Hanks in the movie Castaway has to get his little boat over a giant wave to escape the desert island he’s been trapped on for years. That wave is Cloudbreak. Unfortunately, our trip was interrupted by a storm and we had a couple of additional days when the waves just weren’t breaking. However, when it was breaking, Cloudbreak was firing. Scott Winer took a few good shots of my amateur style trying to surf this epic left for the first time. I envied the goofy-footers on our trip (and noticed curiously that over half of the surfers there were goofy-foot). In the past four years, the Internet has emerged from obscurity to invade our culture faster than any technology in history. Amazingly, though, the Internet is still in its infancy. It has yet to be adopted by 70 percent of U.S. households and remains a huge, mostly untapped market. But not for long: By the end of 2002, this untapped market will shrink to 30 percent of U.S. households, making the Internet a mass-market content and commerce medium. Who will emerge as leaders of this new content and commerce medium? Will it be traditional media giants like Time Warner, Disney, and Fox, or Internet companies like AOL, EarthLink, and Yahoo? Or some mix? These three trends will help define the winners. Traditional businesses have trouble moving at the speed of the Internet. Many believe incorrectly that large media, telecom, and commerce companies can simply move their operations to the Web and replicate their real-world successes. Barnes & Noble, for example, already knows the book business, already has a strong brand, lots of cash in the bank, and book inventories. So, why couldn't it simply build a great Web site and become the KILLER bookstore on the Web? Ask Amazon.com. Most traditional companies fall short because they fail to embrace the Internet quickly and thoroughly enough. The Internet moves so fast that only nimble, scrappy startups can keep up. We have this concept of Internet time: Every year in an Internet business is like seven real-world years. We move seven times faster than the rest of the world. Another problem these companies face is that consumers don't associate their traditional suppliers of products and services with the Internet. When consumers move to the Net, they will choose Internet-specialist brands over traditional brands. Think about the clothes you wear. You buy shoes made by one company, suits by another. When presented with options, educated consumers choose specialist brands over generalist brands. On the Internet, the same is true: The strongest brands are new Internet specialists like Lycos, Infoseek, Yahoo, Amazon.com, CNET, AOL and EarthLink, to name just a few. Traditional brands can overcome this to some extent through partnerships, which is the second trend shaping the Internet space. The right partnerships combine the market power of a traditional media, telecommunications, or commerce company with the Internet-centric focus of an Internet specialist. Consider EarthLink's partnership with Sprint. Although Sprint had entered the dial-up Internet access business, the company recognized that it would be difficult to embrace the dial-up Internet access sector completely, and that consumers actually wanted an Internet-centric brand to provide their access service. Our partnership created a service that is now a contender for the number-one position among pure Internet access providers. This is a near-perfect example of how a traditional player partnered successfully with an Internet company. Others have followed: Disney purchased a stake in Infoseek; NBC purchased a stake in Snap; USA Network announced a merger with Lycos. These partnerships between old and new companies are not only smart, they're inevitable. Expect many more to follow. The third trend defining the market is that growth in the Internet access segment leads the growth of all other segments of the Internet market. The Internet economy is already a major subset of the world economy. But, in order to access that economy, consumers must be connected to the Internet. And the only way to do that is through an Internet service provider like EarthLink or AOL. People want the Internet. More and more, they need it. But they won't get a great Internet experience from AOL, because AOL's economic model is predicated on keeping its users inside of its advertising-laden content. When AOL users are ready to graduate to a pure Internet experience, we're there to help them. Note that when they move to EarthLink, their usage jumps to an average of 42 hours per month — all on the Internet. In summary, when the dust settles, Internet-focused brands will win. That's what consumers want. Traditional players will link up with Internet companies today to position themselves for the future — a future dominated by the Internet economy. And where does that economy begin? Right here. With Internet access companies like EarthLink. Most importantly, the Internet is STILL a ground-floor opportunity.